Help! The sun is rising! In the false dawn before sunrise, the vampires search for a dark resting place for the day. But, just when you think you have found the perfect grave, you find it is already occupied. Or worse, it contains dreaded garlic! Dawn Under is a fun game of searching and memory. It requires some thought, a lot of memory, and, perhaps, a bit of bluff. But, memory is your most important tool in your search for daytime resting places for your vampires. 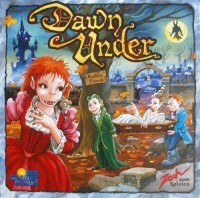 Dawn Under: a family game without numbers, calculations, and scoring. It is a light, but fun game for children, but a challenging game for adults. Add a Review for "Dawn Under"